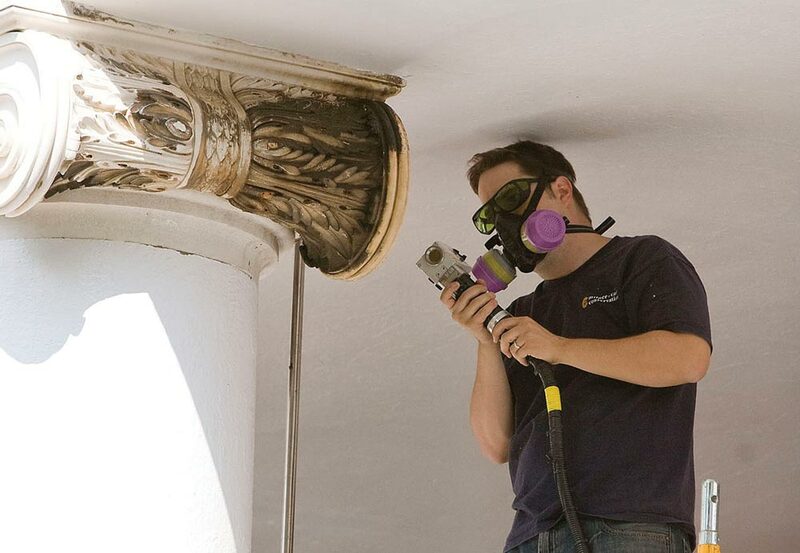 Conservators used a laser to clean 180 years of grime from the column capitals of Pavilion II. Without harming the stone, the laser vaporized the soot and other atmospheric pollutants that had gathered on the white Carrera marble capitals. The fronts of the capitals, facing the Lawn, were cleaned in the 1980s. “When they cleaned it then, they used Bon Ami and a sponge,” says Brian Hogg, senior historic preservation planner with the Office of the Architect for the University. Leigh Hassler (Arch ’00) and colleague Roy J. Ingraffia of Milner + Carr Conservation undertook the painstaking work perched on scaffolds on the pavilion balcony. They wore eye protection and a breathing apparatus while wielding the laser, which cleaned a quarter-inch area with each stroke. The restoration of the original bright white color of the capitals is the most noticeable sign of the pavilion’s extensive renovation, the first in 50 years. Pavilion II will be the residence of Meredith Jung-En Woo, dean of Arts & Sciences, and her family.